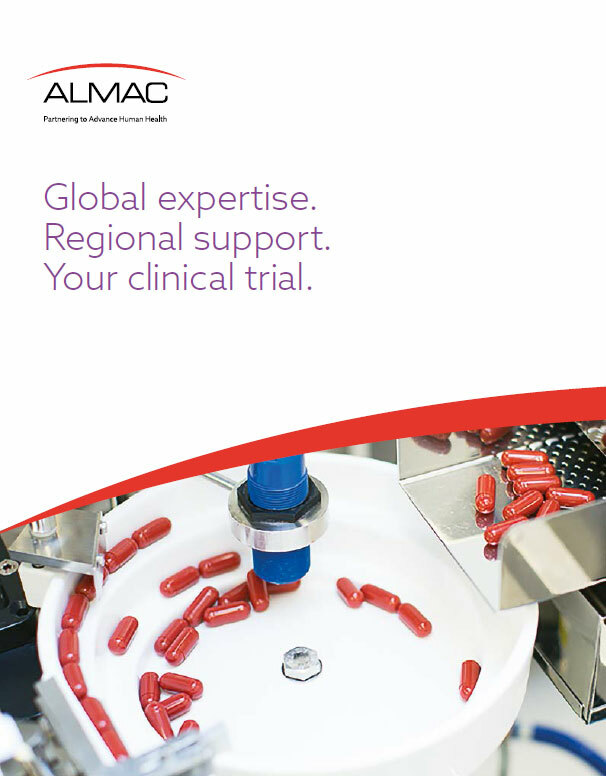 Specializing in solid, oral dosage forms; Almac provide expert Pharmaceutical Drug Product Development Solutions supporting early & late phase clinical trials. Almac Diagnostic Services is a stratified medicine company specializing in biomarker driven clinical trials. Our diagnostic experience spans oncology, immunology, CNS and infective diseases. Almac Clinical Services provides the most comprehensive global clinical supply chain solutions in the marketplace with over 30 years’ experience. Guided by our extensive clinical supply experience and expertise, we are recognized as one of the leading, multi-faceted, global solution providers within the niche and complex market of clinical trial supply. Almac Clinical Services currently provide services to over 600 Pharmaceutical and Biotech companies worldwide including 18 of the top 20 global pharma companies. Utilizing our best in house Supply Chain Management (SCM) expertise, custom designed services and software solutions, we offer the most flexible approach to support the delivery of your global clinical trial from protocol right through to patient delivery. Our core services are designed with flexibility to fit your clinical study requirements.